(TIM WEIGHT/FOR THE EXPRESS) Bellefonte’s Ben McCartney drives toward the basket in last night’s district title game versus Greater Johnstown. Bellefonte lost the game, 75-71. They made it to the top of the District 6 Mountain and refused to be toppled easily. The Bellefonte boys went to battle Monday night against an 18-2 Greater Johnstown team in the District 6 5A title tilt in a prime time contest at Penn State Altoona. Despite a strong effort by the Red Raiders, they fell just short as the Trojans came out the victors in overtime, 75-71. Bellefonte’s Ben McCartney hit the shot heard all around Bellefonte as he sunk a clutch triple to send the game into overtime. Despite the loss, the Red Raiders gave them all they could handle. 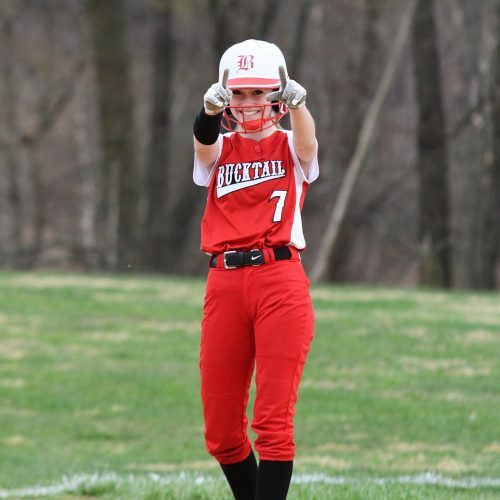 Playing with heart all through the contest, the Red Raiders were able to take the lead into the fourth stanza before an aggressive Trojan team outscored Bellefonte 11-3 in the first minutes en route to the what the Trojans’ thought would be a sure victory. But McCartney launched an off-balance triple with the buzzer sounding to clean the slate, making it a 63-63 tie going into the overtime period. However, Johnstown’s Anderson Franklin made sure that his team wasn’t going to take a third loss as he scored 10 in the period to hold back the “never-say-die” Red Raiders. Nate Tice, who finished with 21, netted 10 in the overtime period to try to keep pace but it just wasn’t enough. Leading the offense for the Trojans was Franklin with 28 points. Bellefonte got 21 from Tice and 28 from McCartney in a losing effort. 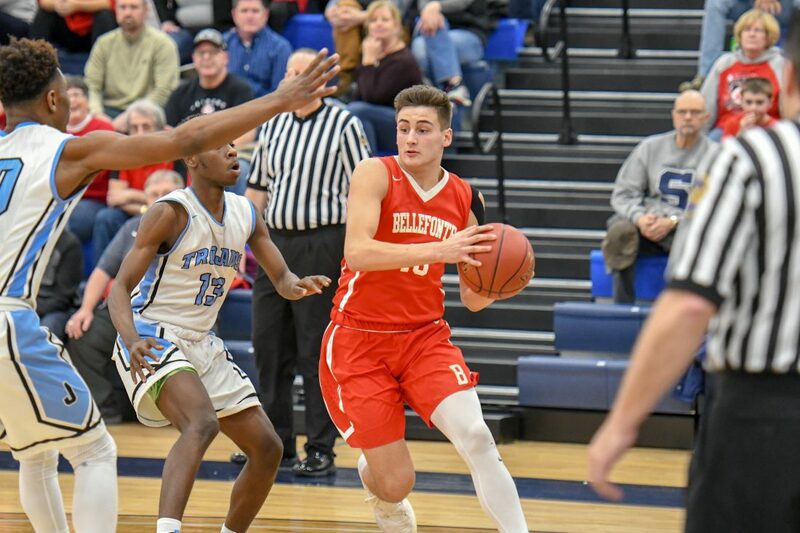 It was a historic run for the Bellefonte boys as they battled through injuries throughout the season, resulting in a 15-7 record coming into the contest. Bellefonte battled to the very end after a strong first quarter run by Greater Johnstown. With the game heading into the overtime period tied at 63, Franklin got things started hitting one-for-two from the line. On the following inbounds, the Red Raiders got the ball to a wide open Tice who plastered the three, taking back the lead at 66-65. After forcing a turnover, teammate Caleb Rockey hit 1-of-2, giving them a 67-65 advantage. Johnstown’s Dewayne Jones hit 2-of-2 from the charity stripe to tie things at 67. Tice put his team back out ahead with two consecutive foul shots of his own. After another Tice bucket, he also hit two more foul shots, making it a 71-67 advantage with 1:27 left. But Franklin cut the lead to one just seconds later after a long triple. 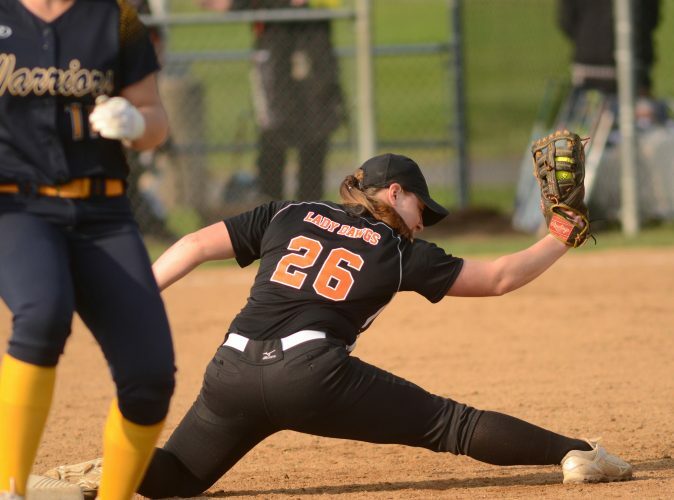 From there it would be a race to see who would end up with the ball last and that would go to the Trojans as Franklin would add the next five points to clinch it for Greater Johnstown. Going into the fourth, Bellefonte had erased the early deficit it had in the first and second quarters to come in with a 46-43 advantage. Things looked grim early on as the Trojans went on an 11-3 run with just under five minutes, taking a 54-49 advantage. But with two consecutive McCartney buckets, the Red Raiders were right back in the contest, trailing by one. Gershon Simon posted a triple, extending the lead back to four points. Bellefonte would trail by as many as seven before rallying back. Making the comeback attempt, the Red Raiders went to Tice who hit a runner in the lane with 1:18 left. After Franklin missed the first chance at a one-on-one chance, Nick Fisher inched his team a little closer hitting 1-of-2 after attacking the basket. After another failed foul attempt by Greater Johnstown, Fisher hit a reverse-scoop shot to bring the Red Raiders to within three. On the following inbounds pass, Rockey intercepted the ball and took it right to the hole, hitting the shot and getting fouled in the process. Rockey hit the free throw and tied the game at 60 with 36.4 ticks left on the clock. However, the combination of a bucket from Joziah Taylor and a free throw by Franklin, gave Bellefonte just nine seconds to try to tie things at 63. They got the ball down low to McCartney and he fell back but the ball went in. After being outscored 21-12 in the first, Bellefonte came in the second quarter and settled in, pushing their way back into the ball game. By the time the third quarter got underway, the Red Raiders closed in and outscored the Trojans 15-7 to set up the later drama. Bellefonte finished its season as District 6 Class 5A runner up, giving their fans a lot to remember from the season. Bellefonte: Ben McCartney 11 6-6 28, Nate Tice 7 6-6 21, Nick Fisher 3 2-3 7, Noah Badger 3 0-0 6, Caleb Rockey 2 1-2 5, Bailey Decker 0 2-2 2 and Isiah Nadolsky 0 2-2 2. Johnstown: Anderson Franklin 13 4-8 28, Dewayne Jones 2 7-10 13, Joziah Taylor 4 0-0 8, Gershon Simon 3 0-0 8, Keyon Gause 1 4-5 6 and Markelle Nattile 3 0-1 5.